Strawberry kheer (Indian Rice Pudding) is an Indian fusion dessert recipe. Give the most loved kheer a unique flavour of fresh strawberries. Kheer is a tasty Indian dessert. It is made using rice, milk, and sugar. 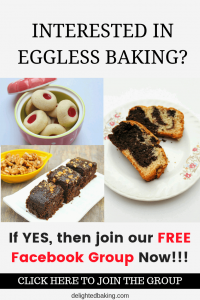 Sometimes dry fruits like almonds, cashews, raisins etc are also added. Kheer can be flavored with elaichi (cardomom) powder. It tastes amazing when served chilled. 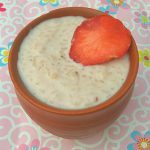 Today I am sharing a flavored kheer recipe – Strawberry Kheer. This recipe uses fresh strawberries. The strawberries give an amazing flavour to this recipe. For incorporating the strawberry in this recipe, we will firstly puree the strawberry in a blender. Fresh strawberry gives an amazing flavour to this recipe. This kheer is perfect for summers. With the fruity flavour of strawberries,this is the perfect summer dessert. Serve this chilled after the dinner or lunch. If you want you can add some dry fruits like chopped almonds and chopped cashews in this. They will further enhance the flavour of the kheer. You can serve this strawberry rice kheer to your guests whenever you party at home. Instead of the usual desserts, the guest would love to eat this fusion dessert recipe. The process of making this strawberry kheer is somewhat similar to the kheer we usually make. We will firstly soak the rice in water for atleast half an hour and after half an hour we will drain the rice. As explained earlier we will puree the strawberries for this recipe. After this we will start making the strawberry kheer. We will boil the milk. Then we will add the rice and will cook the rice in the milk. After the rice grains are cooked completely, we will add the condensed milk. Condensed milk will provide a creamy texture to this strawberry kheer. it would also act as a sweetener. Afterv cooking the kheer for some more time, we will allow the kheer to cool down completely. Now we will add the prepared strawberry puree to the kheer. Mix nicely so that the strawberry puree gets mixed completely with the kheer. 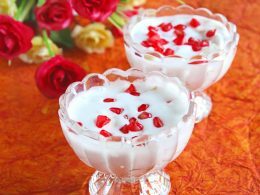 Remember – Do not add the strawberry puree while the kheer is still hot as that can lead to curdling of milk. Keep the strawberry kheer in the fridge for atleast an hour before serving. Strawberry kheer (Indian Rice Pudding) is a dessert that everyone, from kids to grown-ups will love. Tastes best when served chilled! Wash rice using water and soak them in water for at least half an hour. After half an hour, drain the rice and keep aside. Puree the strawberries in a blender and keep aside. In a medium-sized pan, add milk. Let it come to a boil. Lower down the flame and add the rice. Stir and let the rice cook in milk. This will take around 20 minutes as we are cooking the rice on a low flame. Remember to stir often while the rice grains are cooking. After the rice grains have completely cooked, add condensed milk. Mix well and let this simmer for another 5 minutes. Switch off the flame and let the prepared kheer cool down to room temperature. When the kheer has cooled down to room temperature, add the prepared strawberry puree. Mix well. Keep this in the fridge for at least 2 hours.